So much for holding patterns. After a couple of weeks of steady harvesting followed by a couple of weeks of surprise nothing, there was the Lost Harvest Moon Weekend that became the Lost Harvest Weeks. During our cool weeks off, the temperature was calm, steady, early autumnal. Then, over the weekend of September’s full moon, the sun blasted. How the vineyards rained down. 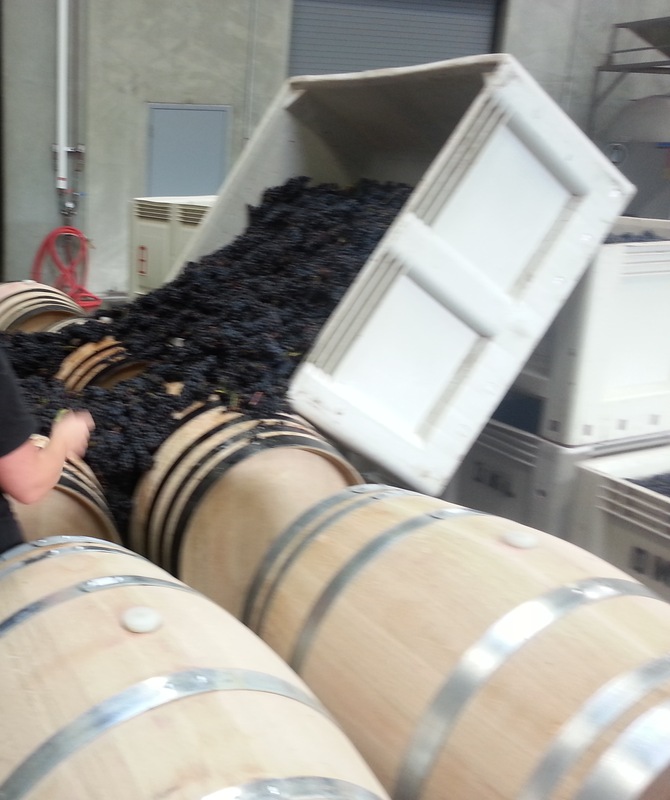 Bacchus roiled over the vines and laughed at our groaning pumps and wheezing presses. Pinot noir and chardonnay for days, pouring onto the crush pad from foggy sunrise to blistering sundown. It was so hot we had to draw down our massive, west-facing roll-up door and pile fruit bins up against the window as a makeshift sunshade for our sunset hours on the sorting table. We’d wait till the sun had fallen below the bank of oak trees to roll it back up again, hours and hours from going home. Hours of cleaning ahead of us. Hours of pumpovers and punchdowns. A 180-minute press cycle still underway. And. We’re talking quantities of fruit not seen in years in California. 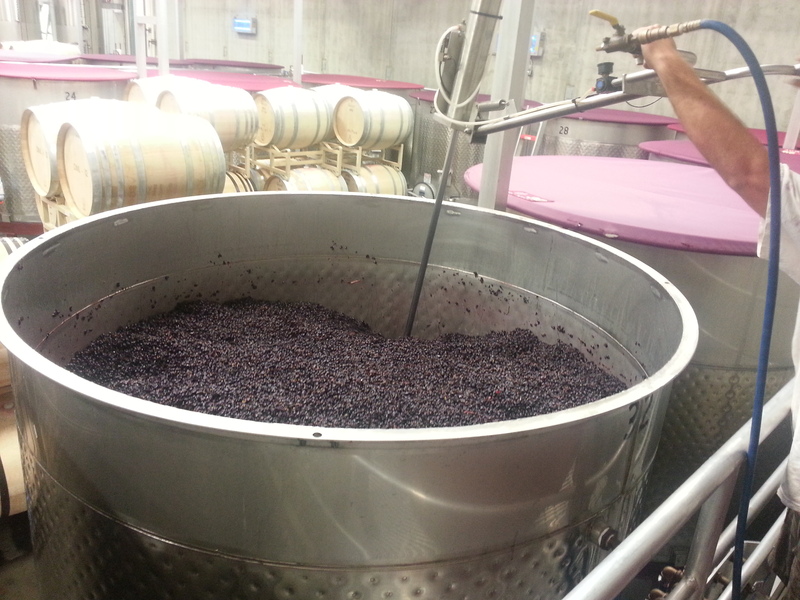 With vineyards coming in sometimes double what previous vintages have produced, we started to run out of tank space. Tetris lives to fight another round. With thirty-five tanks full and fermenting, you can only fill them as fast as you can empty them. 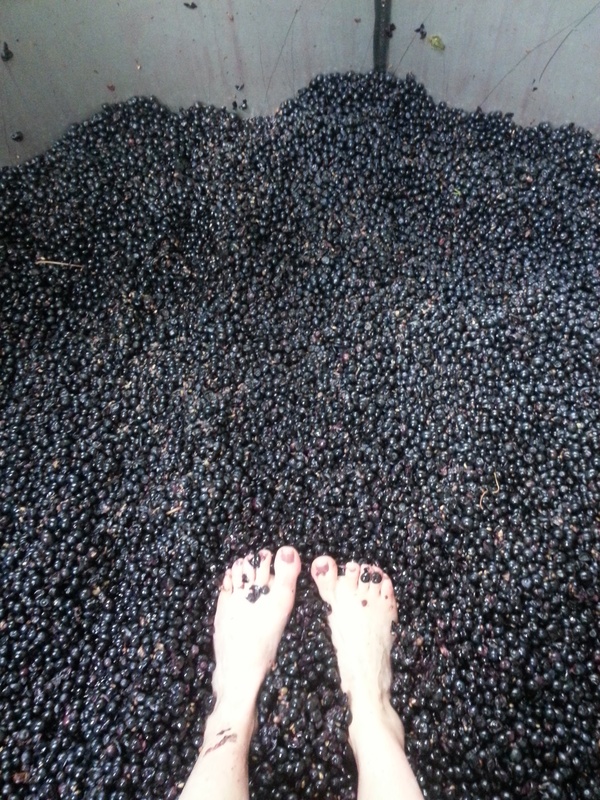 But the grapes pick their own schedule and we were forced to start pressing tanks off before they were fully dry, letting them finish fermenting off the skins or even in barrel. 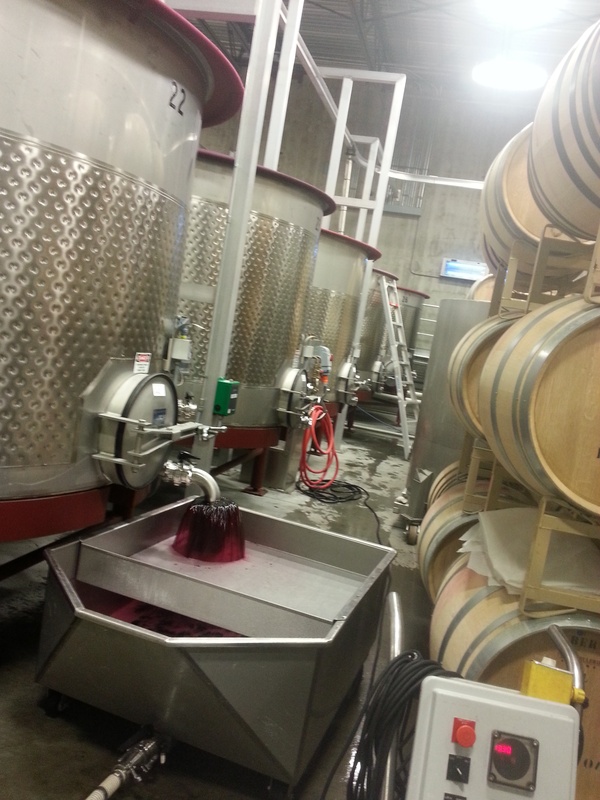 Pressing a little sweet is not wildly out of the ordinary – some wineries do it as a matter of course, especially if they’re looking to dial down the tannins on a ferment, since the more exposure the wine has to its own skins and seeds, the more tannin it takes on. Soon enough, not only were we processing fruit for 10 hours a day, we were also filling barrels. All day. And pressing and digging tanks all day. So we could keep processing fruit. All day. And hoping that our nearly dry wines would finish ferment in barrel. 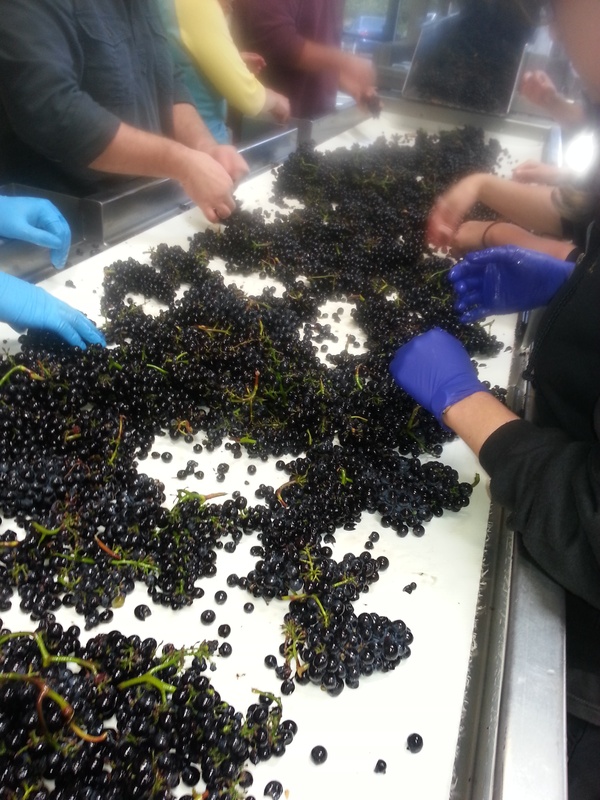 It was one of those inevitable moments during a harvest, when logistics start shaping the winemaking as much as they winemaking shapes the logistics – to the point where the two become nearly interchangeable. 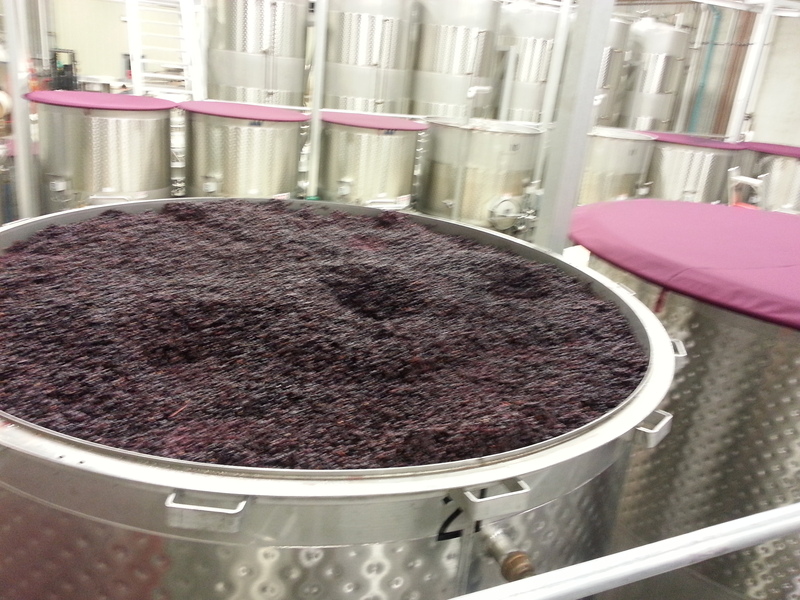 In the mean time, we’ve had to keep our hawk-eyes on the lots finishing ferment off the skins. The priority from the start is always: dry wines. We don’t want stuck ferments. Nobody wants a stuck ferment because it puts the wine in a vulnerable position: not enough protection from the carbon dioxide cover produced by active, living yeast means anything can invade, hogging the available oxygen and nutrients to itself. Bacteria, spoilage, the wrath of fermentation gone awry, the collapse of civilization, &c.
So to feed our finishing, off-dry ferments, we’ve been actively encouraging cannibalism: using the lees from very strong, bone-dry ferments to provide nutrients to finishing ferments. As a result, there’s been a lot of wine movement, on top of everything else. And it doesn’t stop. We have a dozen tanks set to drain within the next week and we’ve already barreled down the core of the Russian River Valley pinot blend – 60 barrels that make up about a third of that finished wine, already in line. We’ve carried on in this way for a few weeks straight. Tired, achy, sleepless, caffeinated weeks. We’re only just reclaiming the occasional day off and enough time to stop and clean the drains and try to fight off the biblical proportions of fruit flies that the heat brought in. And as I’ve experienced twice before now, just when you thought you couldn’t see another barrel or grape . . . therrrrrrres’s that second wind. As with every vintage, there has been lot of chatter this year. Chatter within wineries, amongst them, in the winemaking community writ large, the media, &c. We compare notes, methods, materials, philosophies, nuts and bolts both figurative and literal; sometimes we actually talk about actual nuts and actual bolts. In an industry built on transformation we all try to pin down the things that seem fast and certain: this works, that doesn’t. But just because b follows a does not mean that a caused b. Yeast strands. Irrigation. Additions. Basket presses. Argon. Caustic. &c. Insiders can haggle themselves blue in the face over The Best Way To Do Everything. But we need to be both vigilantly informed and open-minded. In every cellar, every vineyard, different things work, different things make sense. If you can entertain the notion of arguing over approaches, then you are also entertaining the viability of alternatives to your own. It can be hard for us rats to walk the fine line between drinking the Kool Aid so that we can work with conviction and retaining our own opinions as we begin to amass ideas. We are, in addition to professional drain cleaners, the next generation of fermentation shepherds.